Valentine’s Day is just around the corner and I’m rereading one of my Valentine’s Day presents from last year: Essential Dardevil. What makes this so much fun for me is the artwork from Bill Everett. Over the years he has become one of my favorite pencilers and the black and white format really makes his art pop so much. 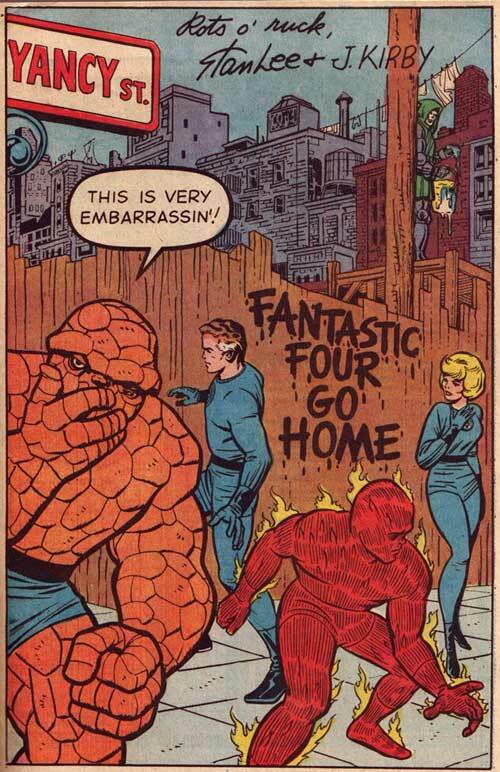 On the story side, Stan Lee presents a typical origin from this time. We start off with a brief flashback before going back and presenting Daredevil’s history. His origin is very straight forward; Matt Murdock was raised by his boxer single dad. Eventually Matt winds up losing his vision albeit in a noble fashion, and his dad’s life is ended by an evil boxing promoter–appropriately named the Fixer. Matt winds up training to confront the Fixer and winds up becoming the super hero that we know and love called Daredevil. The funny part of this story is the fact that there’s a blind guy sewing together the costume, developing a spring loaded grappling hook weapon and becoming a master gymnast/fighter. Matt became much more talented once he lost his vision. The other is that Matt’s best friend, co-lawyer Foggy Nelson and their secretary Karen Page both notice that he’s been disappearing frequently. But they never confronted him once during the issue. Daredevil #1 really wasn’t the best written first appearance of a character especially when you compare it to some of the other stuff Marvel was putting out at the time. But what makes this great, again, is Everett’s artwork. It’s really strong. 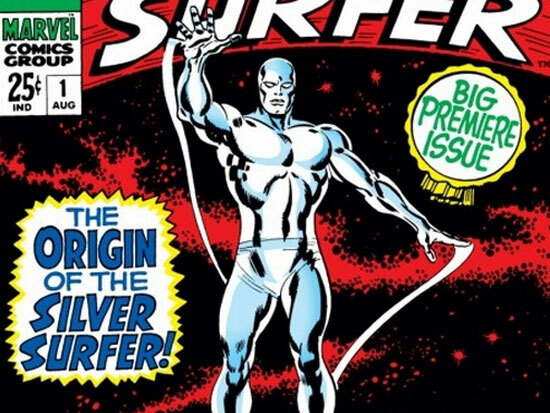 The eighteenth issue of Silver Surfer would be the series’ last and it ends with a bang. 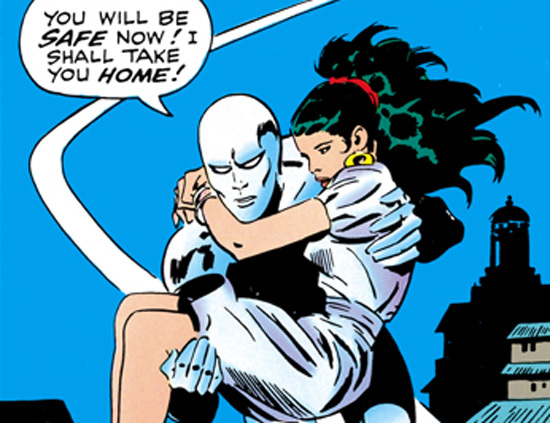 The character’s creators Stan Lee and Jack Kirby are reunited in this issue. With a setting of the story being blue side of the moon that the Inhumans call home, Kirby does some amazing work in this issue. 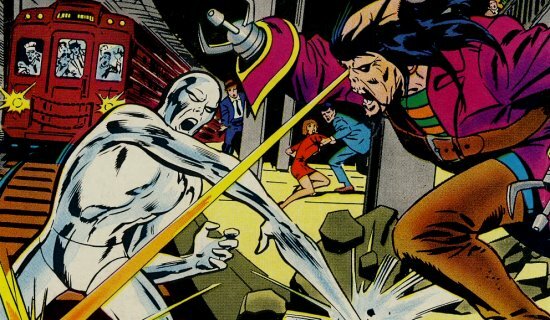 After falling on the moon, Silver Surfer becomes an unwilling pawn in the war between Black Bolt and his evil brother Maximus for control of the Inhumans. After fighting both sides, finally snaps and attacks both sides. The last page of the issue is the above splash page and it pretty much shows that Silver Surfer has had it with the universe. He’s done with humanity (and it’s Inhuman branch). 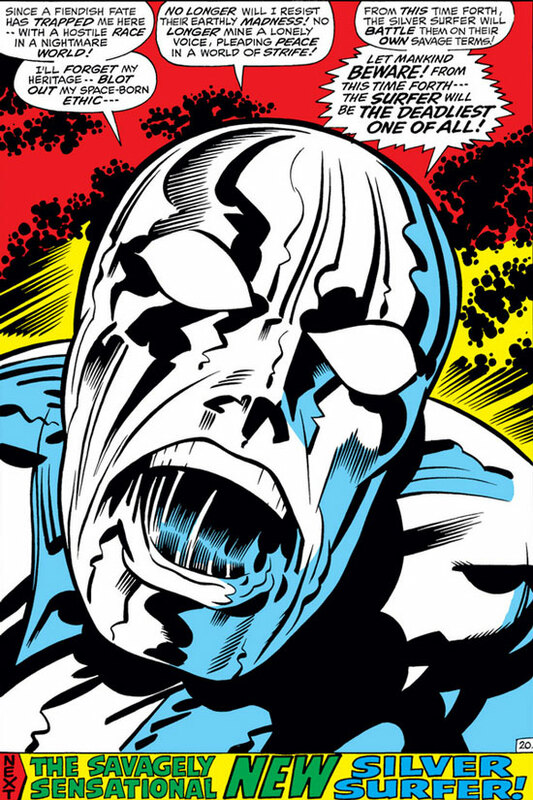 That image of an irate Silver Surfer is just amazing and I’m so glad I read this series, if just for this. Sadly, this was the last issue of the series and whatever direction the “savage” Silver Surfer would have taken is pretty much an unknown. This take on the character didn’t spill over into any of the other Marvel series at the time; he would reappear almost a year later in 1971’s Sub-Mariner. 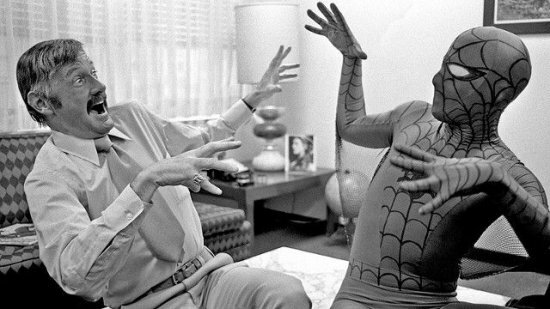 Today longtime Marvel Comics writer/publisher/editor/goodwill ambassador Stan Lee celebrates his ninetieth birthday. The man certainly dissolves a spot in the pantheon of American comic book creators (if not a spot on the Mount Rushmore of them). I know there’s a lot of controversy about how much he contributed in his collaborations with Jack Kirby and Steve Ditko, much of which no one really knows the full story. But that aside, you can’t discount how much effect he had on the direction of comic books at the time. Everyone can agree that comics were pretty lame by the time Lee took over Marvel, and his ideas of the stories that comics could tell helped turn things around. It didn’t hurt that he was collaborating with some of the greatest men to pick up a pencil and comic board. But what he did so well was serve as a public figure-head to why comic books were so much fun. He became the person when people thought about comic book creators (and I still think he holds that title today). Just as Walt Disney and Jim Henson became synonymous with animation and puppetry, Lee did with comics. I think in the modern comics world there really needs to be someone like that who just exudes a certain excitement and showmanship to their craft. In that regards, I think the closest would be Mark Millar, who uses his bombastic personality to get attention to his projects. Anywho, thank Stan for dedicating his life to the medium! The comics world would certainly be completely different without him! 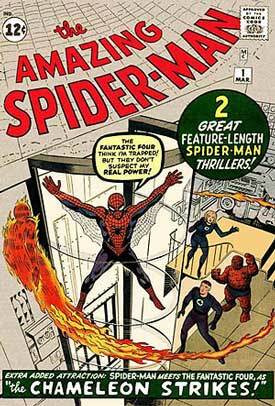 So let’s talk about the first appearance of Spider-Man in Amazing Fantasy #15, which I am so proud to have in my collection. Well not the original, but one of the thousands of reprints they’ve made over the years. Anyway, Steve Ditko and Stan Lee launched Marvel’s most recognizable character with this. I’m not going to talk about the story, because everyone and there mother knows it. So why is Spider-Man one of the most enduring characters in comics? It’s because his origin and makes so much sense. Superman is just a super-powered alien who feels he has to be helpful. Captain America is fighting the good fight, a holdover from World War II. Batman is just motivated by revenge. This was all expanded over the years. But Amazing Fantasy #15 fleshes out the character instantly. 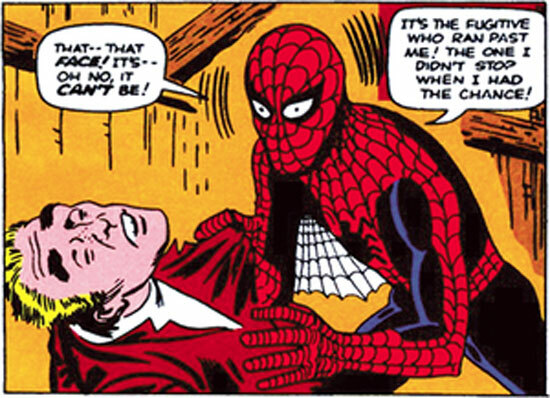 Peter Parker is constantly bullied, but winds up with these amazing (no pun intended) powers. And his arrogance disrupts his life; it’s his fault that Uncle Ben died. Peter takes it upon himself to make sure no one ever experiences the loss of a loved one to a criminal. The beauty is that you get all of that out of one issue. After you read this, you know everything about Peter Parker, his life, his motivations, everything. This just might be the best debut of a character ever. A while back we talked about what a modern-day Jack Kirby without Stan Lee project, so lets talk today about a Stan Lee without Jack Kirby project. We’re talking about BOOM! 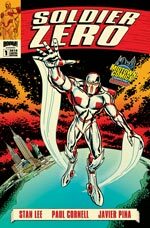 Studio’s Stan Lee’s Soldier Zero: Volume 1, which packages the first story arch. Lee’s involvement in this book seems to me mostly in the concept stage, with Dr. Who scribe Paul Cornell and artists Javier Pina and Sergio Arino rounding out the character. Soldier Zero is a combination of Knight Rider, the Guyver and Venom. Our hero is Stu Trautmann, a war hero who lost the use of his legs after a landmine explosion in Afghanistan. 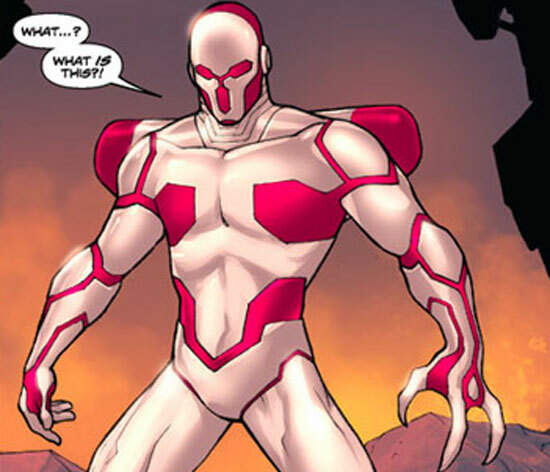 Stu is adjusting to both being in a wheelchair and civilian life when he unwillingly is bonded to the alien symbiotic/parasitic armor entity known as Soldier Zero. Soldier needs Stu’s help in stopping Soldier One, another similar armor symbiote who has gone rogue. Stu has to begrudgingly agree to this, as Soldier One has already gone after his family due to his association with Soldier Zero. Things get only more complicated, as it seems there is a bigger intergalactic conspiracy at hand. It was a decent read, and it really came across like a pitch for a new character. Everything made sense and it was a light read, but it wasn’t necessarily the most compelling story. I will say that it definitely peaked my interest to read the second volume once it comes out. It reads much better as a collection than as single issues. Had I waited monthly for each installment, I probably would have given up on it. The art is fine, and Cornell should get a lot of credit for flushing out the character and making it work in a modern world. Like any comic book that wants to get attention, the issues of Soldier Zero got the multiple cover treatment. The end of the book features a nifty little gallery of all the variant covers from the series. The one on the left, which was an exclusive to New York City’s Midtown Comics was my favorite. I love the way it’s so retro looking. But wait…doesn’t this remind you of something else? Does it remind you of something very familiar from Lee’s storied past, maybe something … silver? 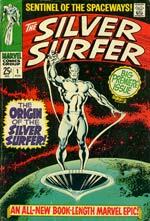 If that cover reminded you of Silver Surfer #1, which graced comic book spinners everywhere in September 1968, you win a prize. 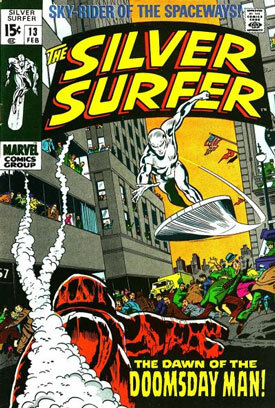 This cover was done by comic artist extraordinaire John Buscema and is one of the most iconic images of the character.